On March 30, just like they do on the last Saturday of every month, parishioners at Presentation of the Blessed Virgin Mary Church in Jamaica gathered for a 7 a.m. pro-life Mass and then marched to pray the rosary outside a nearby abortion clinic. But on this Saturday, their peaceful pray-in had a new and more demonstrative look. For this Lenten season, some of the nearly two dozen parishioners outside the clinic carried signs urging all who could see them to respect life and the unborn. Besides the new signs that had been made, there was another first for the parish on this Saturday. Thirty of the faithful were participating in a Caminata Por La Vida, which is Spanish for “Walk For Life.” The group of men, women and children were traveling by foot nearly 12 miles from Jamaica to a parish in Manhattan to pray with parishioners there for an end to abortions. Typically the 7 a.m. pro-life liturgy at Presentation gets 30 congregants. The Mass is said in Spanish and English because of the heavy presence of Central Americans, especially Guatemalans, in the parish. On this Saturday, nearly 100 people attended. Presentation pastor Father Manuel de Jesus Rodriguez began the pro-life Mass in 2014 over concern for the high rate of abortions among Black and Hispanic women in New York. In his March 6 “Put Out Into The Deep” column in the Tablet, Bishop Nicholas DiMarzio specifically cited Presentation’s Mass and pray-in as an opportunity to promote the value of life from conception to natural death. Maria Batres said she always attends the pro-life Mass but it has more meaning during Lent. “It’s a special season to do something,” she said as a folk choir practiced their songs in Spanish. Before Mass ended, Father Rodriguez and the entire congregation gathered at the altar to bless the walkers on the Caminata. 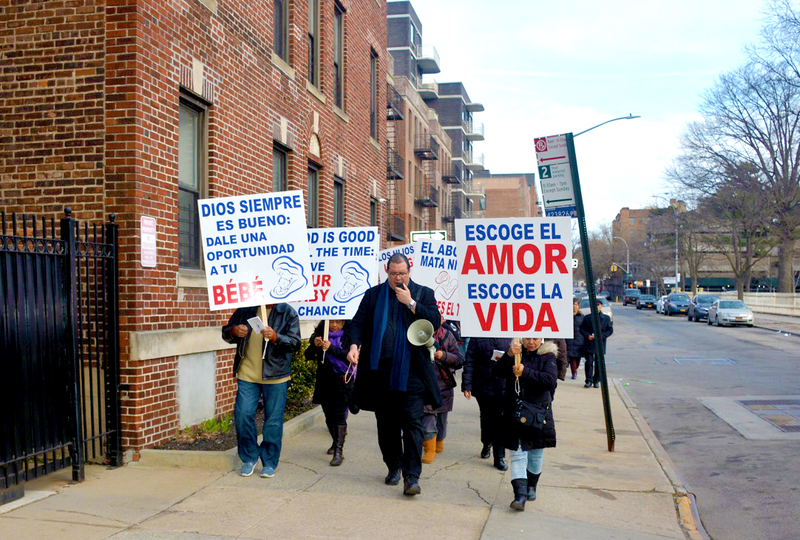 Then after the Mass concluded, another group picked up the large signs that included messages like “Choose Love Choose Life” written in both Spanish and English and began the half-mile walk to the clinic located just off Jamaica Ave. They walked with Father Rodriguez, at 6 feet 5 inches tall, leading the way. They prayed the rosary and sang hymns.